An unordinary holiday experience awaits at Praana Residence. Set atop a hill, with postcard-pretty surroundings and ocean views, the villa offers state of the art amenities, five-star service and opulent living spaces. 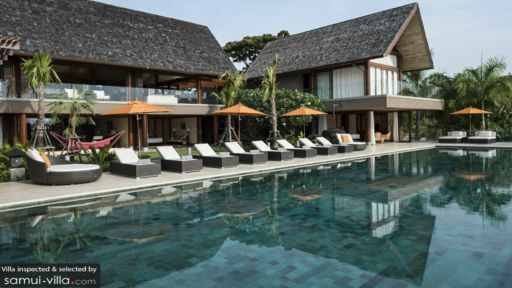 Featuring six bedrooms in total, the villa is ideal for large travelling parties seeking a luxury experience in Samui. Praana Residence offers six capacious bedrooms featuring modern decor and earth-toned hues. Five of the rooms are equipped with king beds, while the sixth features a twin bed setup. The master suite stands out with amenities like a hot tub, sun-drenched balcony and ocean views. Praana Residence comes equipped with a full range of outdoor amenities. There are two sparkling infinity pools to choose from (one of which comes complete with a swim-up bar), a shaded outdoor seating area for relaxation, an alfresco area for dining under the stars, and a tennis court and outdoor boxing ring for guests looking to sweat it out. But the fun doesn’t end when you step in. Unwind with a spa treatment in the sauna and steam room, catch up on your favourite films in the home cinema, bop to the beat on the dance floor or chill out with friends and family in the games room. A nursery and playroom ensure that young children are kept occupied (your villa manager will provide assistance if you need to engage a professional child minder). Beyond the amenities, Praana Residence also offers breathtaking interiors. 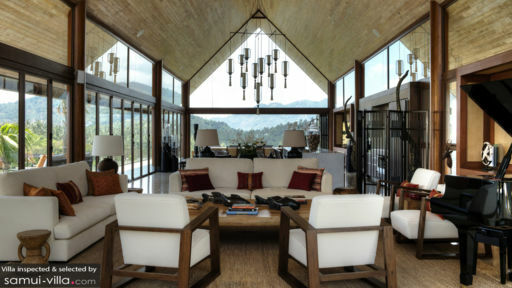 Built to make the best out of its verdant tropical surroundings, the villa features indoor-outdoor spaces and full-length glass walls that bring the outdoors in. The main living area, complete with vaulted ceilings, hanging lamps, a grand piano, fully equipped kitchen with breakfast bar, dining area and lounge creates a sense of awe and splendour. Guests at Praana Residence enjoy housekeeping service, daily breakfast service, personal chef service, and villa manager service. 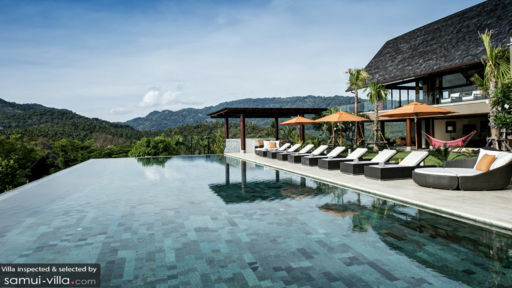 Villa pre-stocking, driver service, laundry service, in-villa spa treatments, Thai cooking class, professional child minding services and excursions are available at additional cost. Praana Residence is located in Bophut, North Samui. From the villa, you’re an 11-minute drive from Bophut Beach. The beach offers good swimming and a family-friendly vibe, along with easy access to a variety of shops, restaurants and bars. The nearest lifestyle hub, located eight minutes’ drive from your villa is Fisherman’s Village. There are boutiques and art galleries to explore, along with a selection of restaurants, cafes and upscale bars for dining. On Friday evenings, stop by at the Fisherman’s Village Walking Street to experience live music performances, as well as the local shopping and street food scene. Bophut’s dining scene throws out a varied selection of healthy cafes, seafront venues and fine dining restaurants. Tree Tops Sky Dining & Bar is absolutely divine; the restaurant combines Chinese and Japanese-style architecture with sweeping ocean views. Unwind at Sirocco Bar, where you’ll sip nightcaps while soaking up the venue’s cosy ambience and jazz music. Supattra Thai Dining is known for its authentic Thai fare. For a relaxed atmosphere and feet-in-the-sand dining, head to Nirvana. The must-sees in any Samui traveller’s itinerary include Big Buddha (Wat Phra Yai) - the island’s cultural landmark. Combine your visit with a tour of Wat Plai Laem, a colourful temple compound located just a skip away. Nature lovers will appreciate attractions like Na Muang Waterfall or Ko Tao. The latter offers a picture-perfect setting, along with excellent scuba diving and freediving. A high-speed ferry ride from Mae Nam Pier lasts about an hour and 45 minutes. If you prefer kicking back and relaxing, there’s still plenty of options to fill up your days. Anantara Spa offers an immersive wellness experience, thanks to its lush tropical setting, and state of the art amenities like alfresco tubs, glass-walled treatment rooms and award-winning spa products. The Yogarden Samui offers a chilled-out ambience, a wide-ranging array of yoga and fitness classes, wellness therapies and a healthy cafe. For a fun-filled Thai cooking class complete with a tour an on-site organic garden, check out InFusion Cooking Classes.